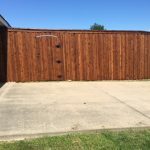 At Frisco Fence, we are committed to educating our clients as to their wood fence, wood fence panels, fence repair, and other wood fencing options while being honest and dependable. Our motto is, “We guarantee happy customers,” which we take very seriously. We are proud to say that our customers are our biggest source of advertising. Frisco Fence’s prices are Routinely cheaper than our fence contractor competition because of our low overhead ( 10% to 50% cheaper ). We NEVER use subcontractors. Our workers only work for us. One of our competitors offers a $50.00 coupon for an online testimonial. We don’t need to do that. Our work speaks for itself. 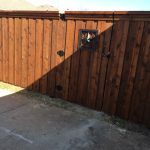 Frisco Fence bids have one price that covers everything. Our competitors like to quote a low per square foot price and then tack on hundreds of dollars in charges for gates and old fence haul off. Frisco Fence always offers a transparent, straight forward price that includes everything. Whether you prefer clear pickets ( no knots ) or pickets with some knots, we build fences with both. Ask me about the No. 1 and No. 2 lumber grades problem and why its misleading to consumers. How’s the quality of our work? Your neighbors just voted us Best fence company in the Frisco Enterprise readers poll. 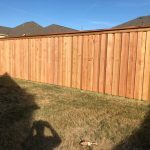 Frisco Fence regularly post pics of completed jobs on this website. Need more convincing? Call our recent customers or drive by their place and see our work up close. View our work in Little Elm Texas, McKinney Texas, Allen Texas, and Prosper Texas. We are insured and registered in all serving cities! ‘Stair stepped’ 8 foot, board on board fence on a corner lot in Prosper. 6 foot board on board, double cap trim for a customer in Celina. New 8 foot board on board, triple cap top trim in Frisco. 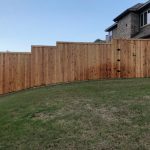 7 Foot Fence w/ Trim in McKinney. 7 foot board on board with top cap trim, enclosing pool equipment in McKinney. 6 foot board on board pre-stained cedar, with triple cap top trim and an iron wrought gate design. 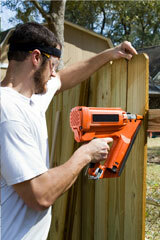 I just wanted to say thank you for the excellent quality and customer service you provided in building our fence. We are delighted with the results. The installers were prompt and very courteous. We would recommend your team to anyone considering having fencing installed. Operation Kindness- A life saving, no kill animal Shelter. © Copyright 2019 Frisco Fence Co, LLC. All Rights Reserved.